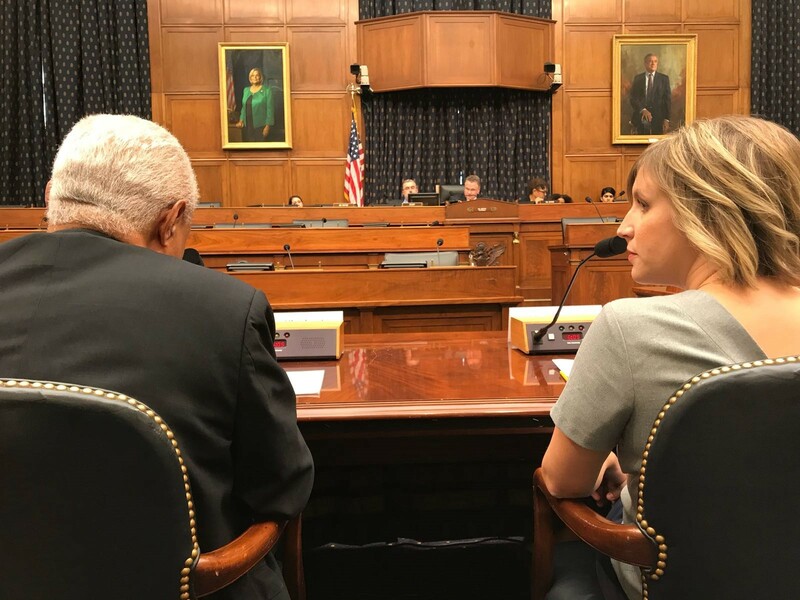 IRI’s Elizabeth Lewis to House Foreign Affairs Committee: It is Vital that the U.S.
Chairman Smith, Ranking Member Bass, and Members of the House Committee on Foreign Affairs, Subcommittee on Africa, Global Health, Global Human Rights, and International Organizations, it is an honor to testify before you today on the upcoming elections in Zimbabwe and the prospects for genuine democratic reform following the end of Robert Mugabe’s 37-year rule. The International Republican Institute (IRI) is a nonprofit, nonpartisan organization established in 1983 that is committed to advancing freedom and democracy worldwide. Since the early 1990s, IRI has supported pro-democracy activists in their struggle to bring real and lasting democratic reform to Zimbabwe, with activities including capacity-building support for democratic political parties, public opinion research, civic education, and fostering citizen and civil society engagement with local elected officials to address service delivery challenges. Over the course of the last four months, Zimbabwe has turned a page in its political history. On the evening of 14 November 2017, several leaders within the Zimbabwe Defence Forces (ZDF) led a coup d’état against the government of Robert Mugabe, which led to Mugabe grudgingly resigning the presidency. Just two weeks ago today, the Zimbabwean opposition leader and former Prime Minister Morgan Tsvangirai succumbed to his battle with cancer — a significant loss to Zimbabweans’ struggle for greater democracy in their country. 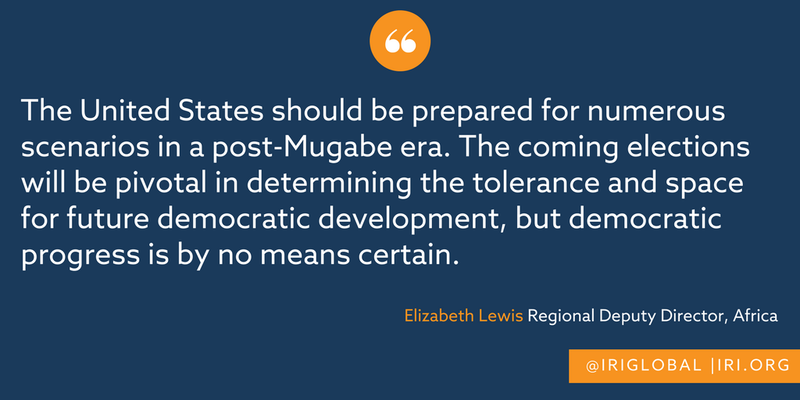 Zimbabwe has arrived at a critical waypoint in its journey toward democracy. The departure of Mugabe and Tsvangirai has upset the political order and left a leadership vacuum. Mugabe’s ZANU-PF and Tsvangirai’s Movement for Democratic Change (MDC-T) had already been engaged in succession battles prior to Mugabe’s resignation and Tsvangirai’s passing, and while some see the present situation as an opportunity for positive change, it is also a very fragile time for both the opposition and ruling factions. The next 6–12 months will prove decisive in determining the trajectory of Zimbabwe’s democratic development. Between the start of the military coup on November 14, 2017 and Mugabe’s resignation on November 21, thousands of Zimbabweans poured onto the streets of Harare in a euphoric expression of free speech, shouting “Mugabe must go.” This experience encouraged reformers and democracy activists to push for more significant change in the post-Mugabe period. While Mugabe’s ouster was an important moment, it is important not to overstate its impact in achieving democratic change. At the same time Zimbabweans were on the streets clamoring for democratic change, the leaders of the coup were busy negotiating with ZANU-PF on plans for a tightly controlled non-democratic transition. engaged in an exercise of simply shifting the deck chairs. Mnangagwa, known from his days in the liberation struggle as the “Crocodile,” was also Mugabe’s Minister of Defence and Minister of Justice. While in charge of the country’s security and intelligence apparatus, he is widely believed to have played a central role in Gukurahundi — a series of massacres of Ndebele citizens by the Zimbabwe National Army from 1983 to 1987. Mnangagwa’s reputation precedes him, leaving many skeptical of the prospect for genuine democratic reform under his leadership. In fact, one of his first acts as president represented just how little has changed since Mugabe’s resignation. He appointed a new 22-member cabinet that included ZANU-PF hardliners with strong links to the liberation struggle and several military leaders who led the coup that put Mnangagwa into power. For instance, General Major Sibusiso Moyo, the soldier who announced Mugabe’s ouster on the state broadcaster — now occupies a crucial cabinet post as Minister of Foreign Affairs. Zimbabwe’s fractured political opposition is represented by several loose and evolving coalitions of political parties from both the historical opposition — including Tsvangirai’s MDC-T — and defectors from ZANU-PF, including Joice Mujuru and her National People’s Party. To date, the three main opposition coalitions — the MDC Alliance, People’s Rainbow Coalition, and Coalition of Democrats (CODE) — have been unable to unite under a single cohesive electoral and governing coalition. In fact, attempts to do so have only bred further disagreement over coalition leadership, member parties, and the division of elective seats. Opposition parties have been in a state of general disarray since the 2013 elections. The days immediately surrounding Tsvangirai’s death have put a spotlight on MDC-T’s internal challenges to unify and compete for votes in just a few short months. While Tsvangirai’s funeral reinvigorated many opposition supporters — bringing out thousands dressed in MDC-T’s signature red color — violence and harassment targeting Vice President Thokozani Khupe, Secretary General Douglas Mwonzora and other senior party leaders cast a shadow over the occasion. This violence was fueled in part by a very public scramble for control of MDC-T following Tsvangirai’s death. According to Zimbabwe’s 2013 Constitution, barring a dissolution of Parliament, the 2018 elections must occur between July 23 and August 22. However, in recent statements (including at the World Economic Forum in Davos, Switzerland) President Mnangagwa indicated that elections would occur before July 2018, and pledged that “this time around, Zimbabwe is open and transparent. We want to have free, fair, credible elections, free of violence.” Yet Zimbabwe’s electoral history makes the prospect of holding free and fair elections in just a matter of months questionable; moreover, the Zimbabwe Electoral Commission (ZEC) has yet to announce its final operational plan for managing the elections. The biometric voter registration (BVR) process began in Zimbabwe on September 14, 2017. 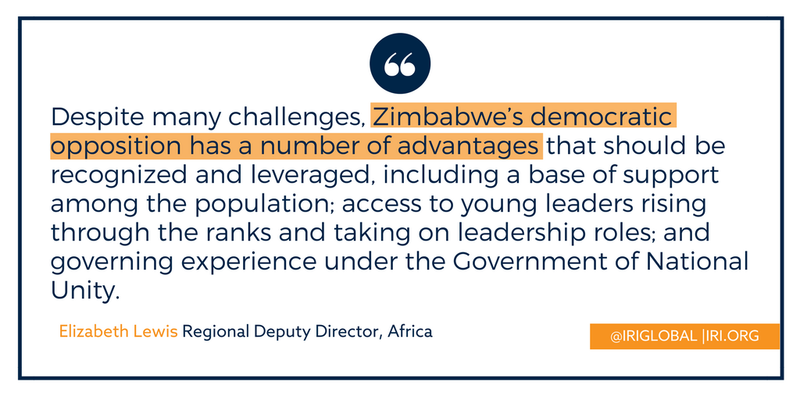 In observing the process, the Zimbabwe Election Support Network (ZESN) indicated that turnout for the BVR process was low, particularly among young people. The group cited limited voter education, intimidation of registrants and misrepresentation of ID requirements (particularly in rural areas), and absence of signage marking registration centers as contributing factors. By the end of the voter registration blitz on December 19, the total number of voters registered amounted to only 65 percent of the ZEC’s stated goal of 7.2 million. Following calls by political and civil society stakeholders to extend the process arguing the coup changed people’s motivations to vote, the ZEC held a “mop-up” exercise from January 10 to February 8, registering nearly 400,000 additional voters. However, ZESN reported that “it is clear that judging by the turnout in urban areas, there is still a large number of people that were not served by 08 February 2018, when the mop-up exercise ended.” While voter registration continues until 12 days following the confirmation of candidates, the process now turns to the de-duplication procedure and inspection of the voter roll — important tasks that will need to be completed very quickly for elections to occur on time. The challenge of high rates of voter illiteracy, as evidenced through the voter registration process, must be addressed through extensive voter education efforts in the lead up to Election Day. However, the short and still unannounced timeline to Election Day, combined with the challenges of misinformation, fears of violence and intimidation, and a historical legacy of election fraud — makes this a significant undertaking. The lack of transparency around many of the processes and decisions made by the ZEC and doubts over the competitiveness of the electoral environment will continue to feed high levels of voter apathy and political tension, especially among youth. In addition to the technical capacity and financial needs required for the ZEC to hold a free, fair and credible election (which the African Union has pledged to support), the environment in which campaigns and elections occur must be conducive to genuine political competition. For this to happen, several laws in Zimbabwe used to limit freedom of speech, free press and assembly, and restrict access to information must be repealed or reformed to align with the 2013 Constitution. These repressive laws include the Public Order and Security Act, the Access to Information and Protection of Privacy Act, the Interception of Communications Act, and the Criminal Law (Codification and Reform) Act. The Electoral Law itself requires a substantial overhaul to align with the 2013 Constitution, including making the ZEC entirely independent and addressing the issue of diaspora voting. Finally, the importance of a viable opposition capable of competing in the electoral process cannot be understated. A critical benchmark in achieving this is the prevention of a supermajority in the Zimbabwean National Assembly — which ZANU-PF currently has — to prevent further amendments to the 2013 Constitution that would restrict political space and fundamental freedoms or grant additional powers to the presidency. In the post-election period, it is critical that the opposition demonstrate its cohesiveness and capacity to serve as a check on government power and advocate for the interests and priorities of its constituents. The United States must be ardent in its support of free and fair elections. The citizen movements of last year, including #ThisFlag and Tajamuka, and the outpouring of citizens who took to the streets to celebrate the resignation of Mugabe are evidence of the strong desire for genuine change, and the 2018 elections will be a pivotal point for Zimbabwe. The current government lacks electoral legitimacy and has a stated interest in returning to full constitutional order. Considering this alignment of interests, the U.S. must offer its unwavering support for a free, fair, transparent and credible electoral process. 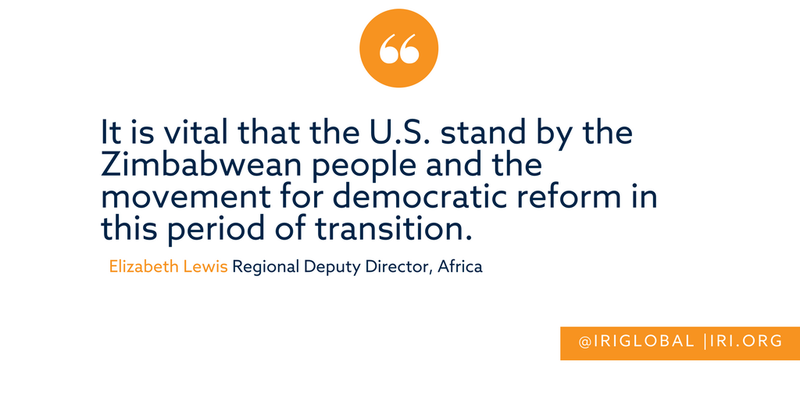 Key U.S.-based, regional and international partners, including IRI, are already doing important work to support stakeholders including the ZEC, civil society and political parties ahead of the 2018 election, but this support must be expanded. Key areas requiring additional attention include: civic education, in order to ensure that citizens are informed of the process and their rights ahead of Election Day; initiatives to combat fake news, disinformation and restrictions to the media and access to information; efforts to safeguard the vote, including the unhindered observation of the process by political parties and domestic and international observers; and activities to deliver an open and non-violent electoral process at all stages, from campaigning to electoral dispute resolution. To achieve these objectives, the United States must redouble its efforts to work with our Zimbabwean and regional partners — especially the Southern African Development Community (SADC) and African Union — to stand for nothing less than a transition to democratic rule through a free, fair, transparent and credible electoral process. 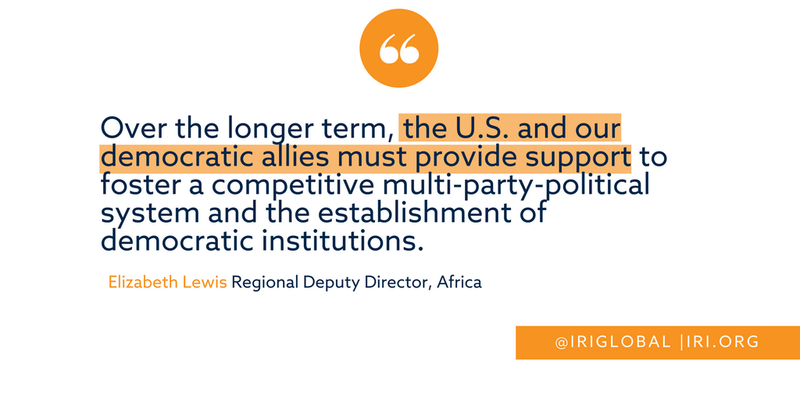 Over the longer term, the U.S. and our democratic allies must provide support to foster a competitive multi-party-political system and the establishment of democratic institutions. As those of us who work in the field of democracy and governance assistance understand all-too-well, elections are just one part of a much larger democratic process. The overall health and maturation of Zimbabwe’s democratic system requires a strong multi-party system. Despite many challenges, Zimbabwe’s democratic opposition has a number of advantages that should be recognized and leveraged, including a base of support among the population; access to young leaders rising through the ranks and taking on leadership roles; and governing experience under the Government of National Unity (a power-sharing agreement with ZANU-PF following the disputed 2008 elections), when despite the limitations of their position, they were able to achieve some successes in the management of the economy. A viable opposition is essential to a healthy Zimbabwean democracy, particularly in serving as a counterbalance to the ruling party’s ability to expand its powers through the legislative process. In addition to increasing political competition, other critical areas requiring attention include judicial, criminal justice and security reform; opening the information space; the full implementation of the 2013 Constitution; the need for responsive and participatory governance and service delivery; and a legitimate truth and reconciliation process. Again, engagement and support to Zimbabwean and regional partners in these areas is critical. increasingly visible role in the party has everything to lose from a shift in the power dynamics of the country. Political repression and disregard for fundamental human and political rights is an ongoing problem in Zimbabwe, and we need to be vigilant under the new dispensation in the lead up to and following elections. U.S. policy toward Zimbabwe should be formulated to consider the multitude of scenarios that could unfold in the coming months. The United States must hold the line with targeted sanctions and within international finance institutions to require the implementation of key reforms as a precursor to lending or debt/sanctions relief. Prior to the coup, one of the top issues discussed in the international arena regarding Zimbabwe was the clearing of its arrears with international finance institutions, namely the World Bank and African Development Bank, with the intent of making Zimbabwe eligible to participate in new lending programs. Under the new dispensation, debate over these issues has intensified, as the revival of Zimbabwe’s long-suffering economy is a top priority for the Mnangagwa administration and the international community. Other international partners, especially the United Kingdom, have been quick to support and engage with the new regime, and China has a historical legacy as a patron of ZANU-PF. Unlike the EU, which lifted sanctions on Zimbabwe on January 25 (except for two individuals: Robert and Grace Mugabe), the U.S. recently renewed its targeted sanctions on individuals including President Mnangagwa. Sanctions and U.S. influence in international financial institutions are our strongest points of leverage in discussions over democratic reforms and respect for fundamental human rights and freedoms. The International Monetary Fund (IMF) announced on February 2 that it will only lend to Zimbabwe if it clears its debts with other multilateral institutions. Given the leadership role that the U.S. holds in the World Bank, it is vital that we hold the line until true progress and good will is demonstrated by the Mnangagwa administration and ZANU-PF officials. The International Republican Institute is a nonprofit, nonpartisan organization committed to advancing freedom and democracy worldwide.